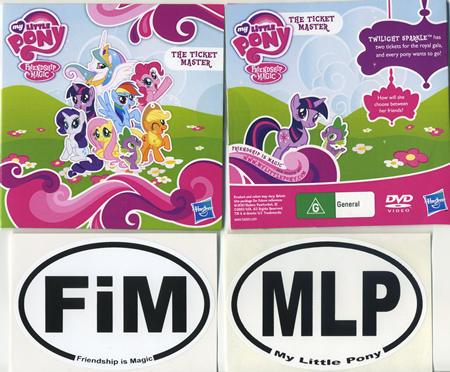 Win a My Little Pony Friendship is Magic DVD and MLP FiM stickers in this easy to enter contest! Yay The Site Isn’t Busted Anymore giveaway! When did you first realize that you were a My Little Pony fan? If we somehow reach enough comments on this over the weekend, just keep commenting and I’ll pick a winner on Monday. As far as I’m concerned, everyone who comments up until the moment I close comments is sill eligible so enter away! The winners will be announced on the blog so keep an eye out. NextBrony Media Round-up: My Little Pony Friendship is Magic Season Two is here! New items just added to our eBay store on 09/30/09! My comment as far as MLP goes is that I’ve been a fan since around 1982. Hehe, shows how old I am. 🙂 I still have a bunch of the old ponies. I apologize if this is too long but… here’s my story. ^^ So, as my name suggests, I am a brony and it was only recently that I actually discovered that I was a brony. lol. I am a youtube surfer (it’s relevant! give it time) and I tend to subscribe to other users that seem to like the general things that I do (it really cuts down on searching). Well, one day, one of my sub…scribee? One of the people I follow liked a video called PONIES The Anthology by ZephyrStar. So, naturally I clicked it. I just couldn’t stop myself from watching it over a few times. I went to bed that night with ponies on my mind. I just, couldn’t stop thinking about them. Derpy hooves stuck out the most in my head and the next day I just had to see the series. I got off of work at 10 that night, sat down in front of my computer, and watched the entire first season. I didn’t question my actions until the end of the tenth episode, and even then it was only after I had clicked the link for the next episode. Finally, 6 in the morning had arrived and I could not last any longer. I passed out and dreamed of Rainbow Dash, Fluttershy, Derpy Hooves, even Twilight Sparkle. Even then, I wasn’t sure that I was a true brony. So I searched youtube for more pony videos, watched the episodes again, looked up all of the memes, gathered as much information as I could before season 2 started. I downloaded some awesome brony music that I found from a mlp fim countdown site. Season 2 would begin in just a few weeks, and I was truly excited. I talked about it at work, I dreamed about it, I searched out the trailers and then I finally knew that I was a brony. To celebrate it, I found my favorite pony related videos and websites and posted them every hour on the hour the day of the premeire. I stayed up all night so that I could watch the new episode on a live stream (because I don’t get that channel) and it was awesome. When I first started watching MLP:FiM about a week after season 1 was done. 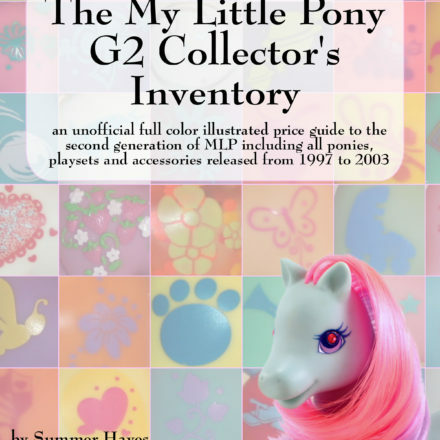 I got my first pony when I was 6 at my birthday party- it was Blueberry Baskets! I love how she smelled like blueberries and how pretty she was. After that I would get a few for holidays, and even remember getting a bunch at a garage sale. I got back into collecting in 2010 when my husband and I were redecorating a room to look “80s toy” style, and fell in love again! I watched the show on TV as a child ad I would rent Escape From/Rescue at Midnight Castle practically every week when I was at my grandma’s house. My first pony was a High Flyer my aunt bought me fro Kmart for my birthday. 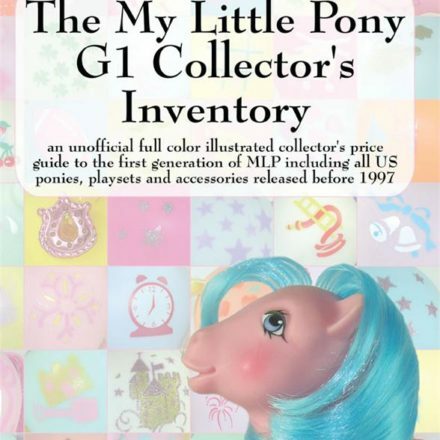 I loved my little pony when I was a child and it was all about the g1s. When I found my “childhood” collection when i was in my early teens it all started back up again. 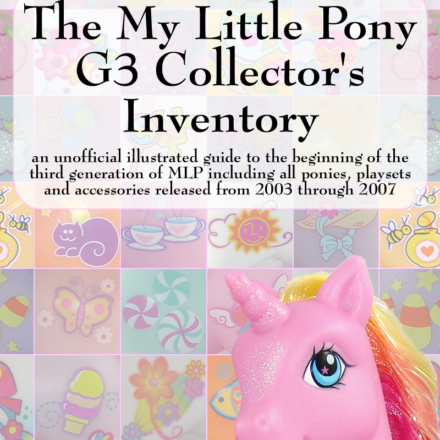 By that time G3 had been released and I bought pretty much every single one I could find – along with g1s and 2s from ebay. After a few years I didn’t loose interest so to speak I just stopped buying them (around the time g3.5 reared its…interesting…head). Early this year my boyfreind asked me if I had seen FIM – which I had avoided as it was new. So I watched them all, and now im hooked again. I waited months and months for ponys to come out in the shops in the UK so had to buy g4s from france to pass the time. I’ve like MLP since I was a little kid in the 80s. I got them as birthday presents and LOVED going to garage sales because my mom would buy whatever ponies my sisters and I could find. I have since found out that the Paradise Estate that I got as a birthday present was actually picked up at a garage sale. The previous owners must not have hardly played with it at all because it was in pristine condition and still had the little stuff (even the forks!). It was pretty awesome. 🙂 I started collecting again in late high school when I started using the internet. Love MLP!! Been a fan since the 80’s. I like the new FIM and have some of them as well as the older ones. I first realized I was a My Little Pony fan when I was about 3, I used to watch the old school MLP cartoons. Sadly they took it off the air not too long after that but I still watched the DVDs and I have kept up with all the different MLP generation changes. I love the Friendship is Magic series too, it’s super cute and just a lot of fun to watch! 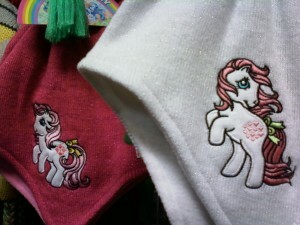 II knew when I was little in the 80’s that I loved my little ponies. I still have hundreds of them. My oldest daughter has a bunch of g3’s now time to get the little one started on them. I have been a mlp fan Since i was born in 1985.i still play and collect them.Lickety split is my favorite mlp next to the new pinkie pie! I was a fan of My Little Pony’s as a child. My older sister had them before I was even old enough to play with them, then I got my own collection as I grew. but being converted to FiM was a harder sell for me. As an adult I had trouble with the changes to the Ponies, and the anime-fictation of most of my favorite childhood toys. (Littlest Pet Shop for example resembles PokeMon FAR more than it resembles it’s 1990’s roots.) At first I had no desire to embrace the new genre at ALL. I’ve been around a fan since the 1990’s. We lived on an island in Alaska at the time, moved to another state, and found the toys in thrift stores. Since then, it’s been history. I think I knew I was fan of mlp’s when I started mounting shelves on my wall to display them……now they have their own room!!! I have been a fan since I was born in 1984. 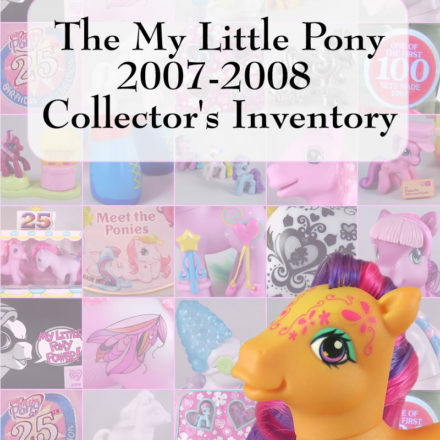 I got my first pony that year and started a great collection! Blueberry Baskets is one of my favorite ponies! Smells so good! There is something magical about her. OK, we have enough comments now but, to be a sport, I’m not going to close the comments until the end of the weekend to give any last minute entries time to sneak in under the wire. Then I’ll pick the winners and announce them on Monday. Thanks for all your participating, everyone! I started maybe 1 year ago. I heard about this on Reddit, so I decided to check it out. Pretty soon, I watched the whole 1st season in a day. I loved it. So much happiness and charm. I watch it daily, and I just love this show.